Like any good programmer, I drink a lot of coffee. I've been brewing my own espresso using a Bialetti stove top coffee maker for most of two decades. Particularly on Sunday mornings, I enjoy the deliberate process of grinding fresh beans, perfectly packing the little filter, intently listening for the bubbly, gurgly final moments of an absolutely perfect brew. But on work days, I just want a damn coffee :-) Quickly. Oh, and it's never fun cleaning a stove top espresso maker. Not even on Sundays. 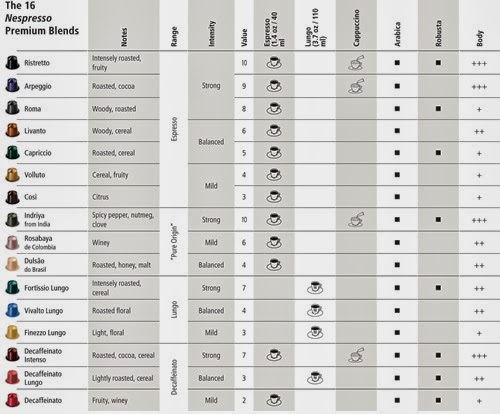 So earlier this year, I made the switch to a Nespresso Pixie. Wow. Perfect espressos, cappuccinos, lattes, americanos, and (my favorite) cortados, every single time. Less than 2 minutes per cup. And no mess :-) At all. Ever. The only problem? A classic paradox of choice! I suppose the pods are cleverly color-coded, but with 16 different hued options, about all I can remember is that black=strong+bold, and red=decaf. The 14 others are complete mysteries to me, and I've long since tossed the packaging material that accompanied the original variety pack. 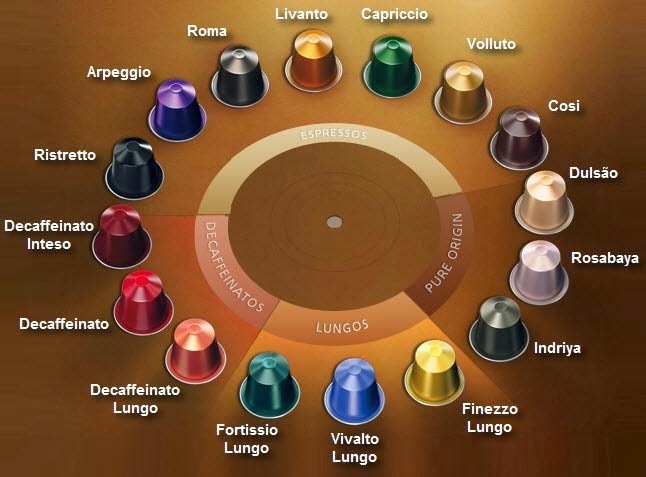 I searched for a Nespresso flavor chart, and the closest thing I found was this flavor wheel chart. But at 500x414 pixels, the resolution was too low to print legibly. I couldn't find a higher resolution image anywhere.